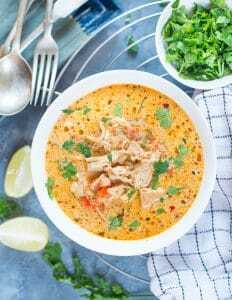 Slow Cooker Coconut Chicken Curry with amazing flavours is rich and creamy. 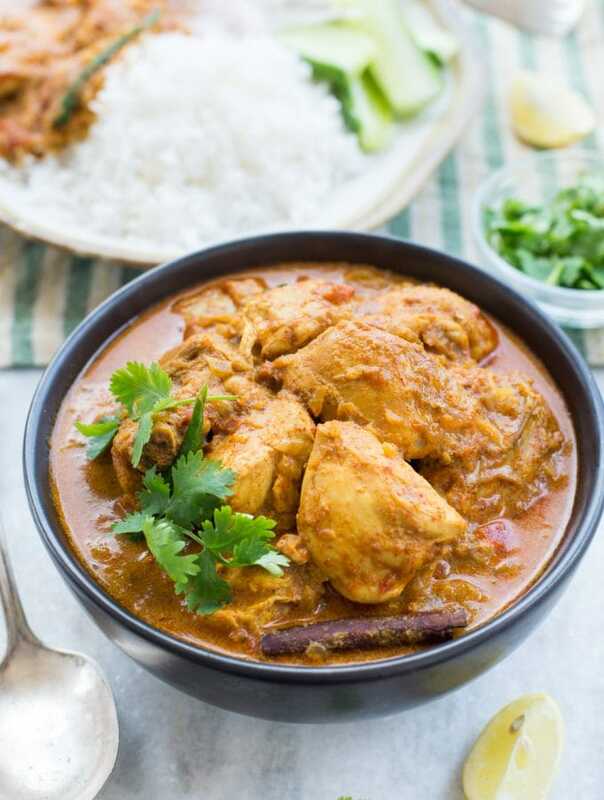 This Indian Chicken Curry with juicy tender chicken can be served over rice or naan bread. Coconut Chicken Curry is made with bone-in chicken pieces sauteed in onion, ginger garlic paste, tomato, spices and slow cooked. Adding coconut milk makes the gravy silky smooth and rich. 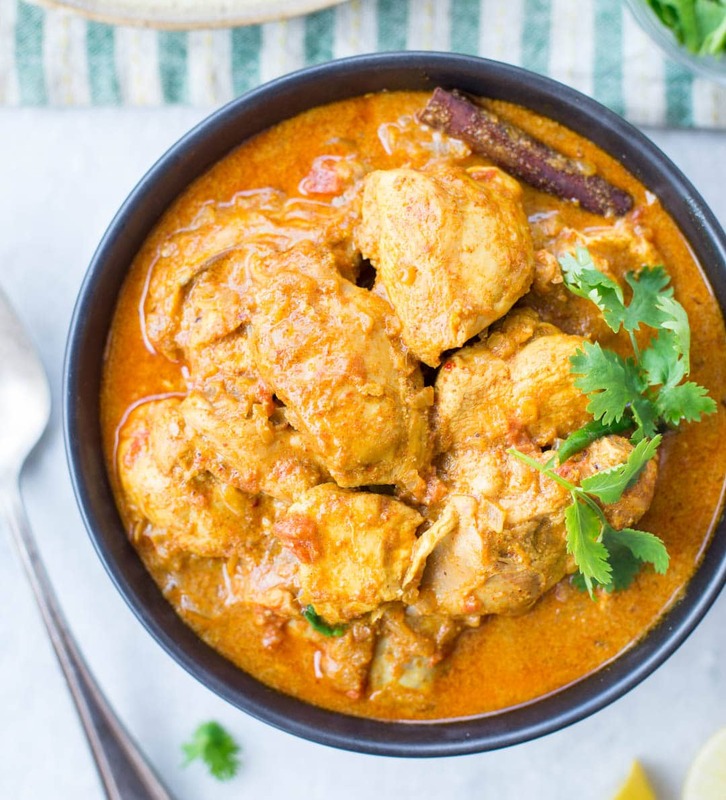 This Chicken Curry With Coconut Milk is made with freshly ground spices for authentic flavours. Slow cooking the chicken ensures the Chicken pieces remain Juicy and tender. Chicken Curry appears very often in our menu. 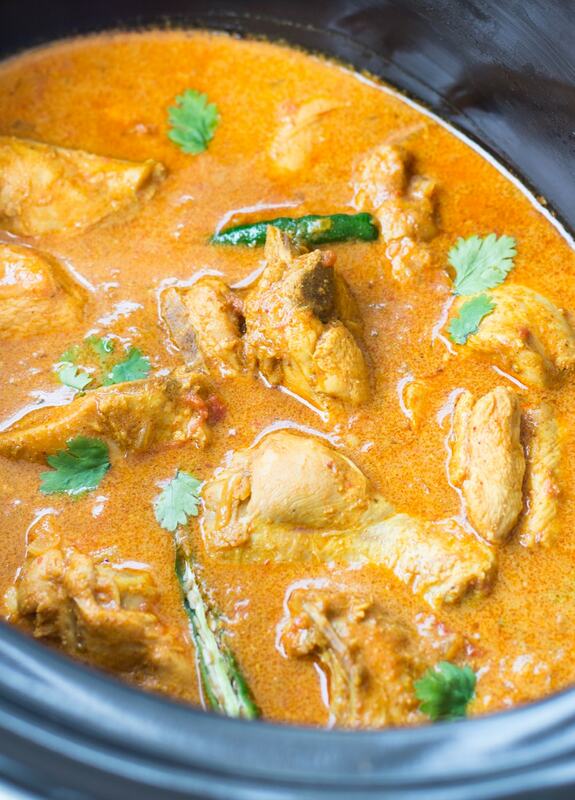 This Chicken Curry is one of my go-to recipes. It is not very spicy. 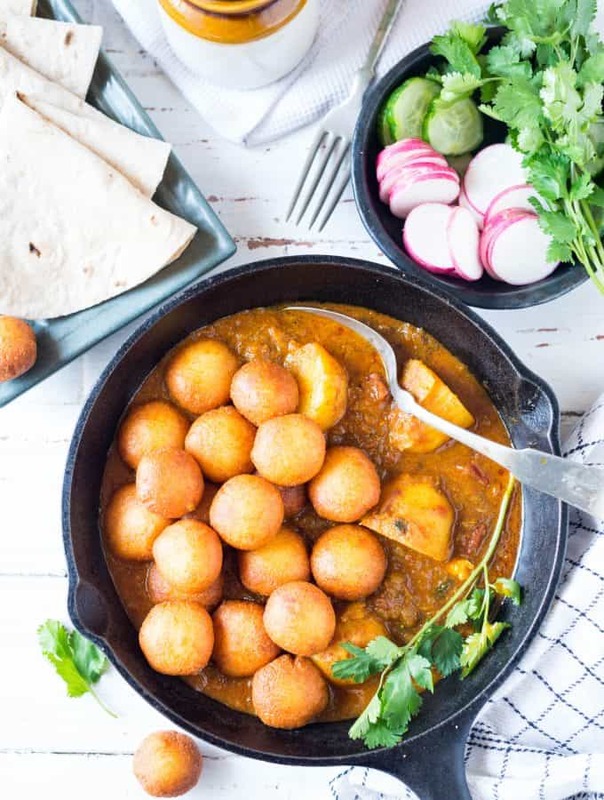 The gravy is creamy and rich with a subtle flavour from coconut milk. If you ask me to pick rice or naan, my answer would be rice. Because I am a little biased when it comes to choosing between rice and roti. 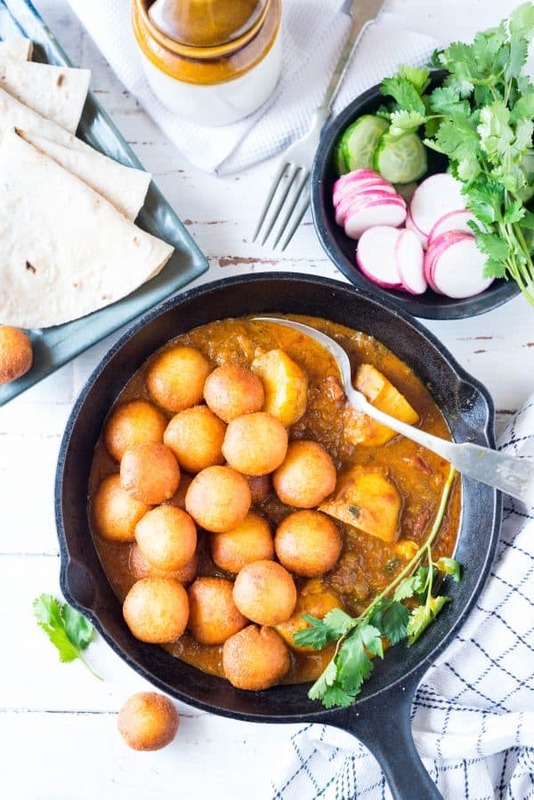 But this curry goes very well with roti/Indian Flatbreads. 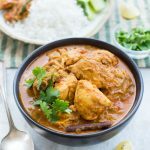 Slow cooker Chicken curry is my go-to Indian Chicken Curry recipe made in a slow cooker. You can certainly make this on the stove top. 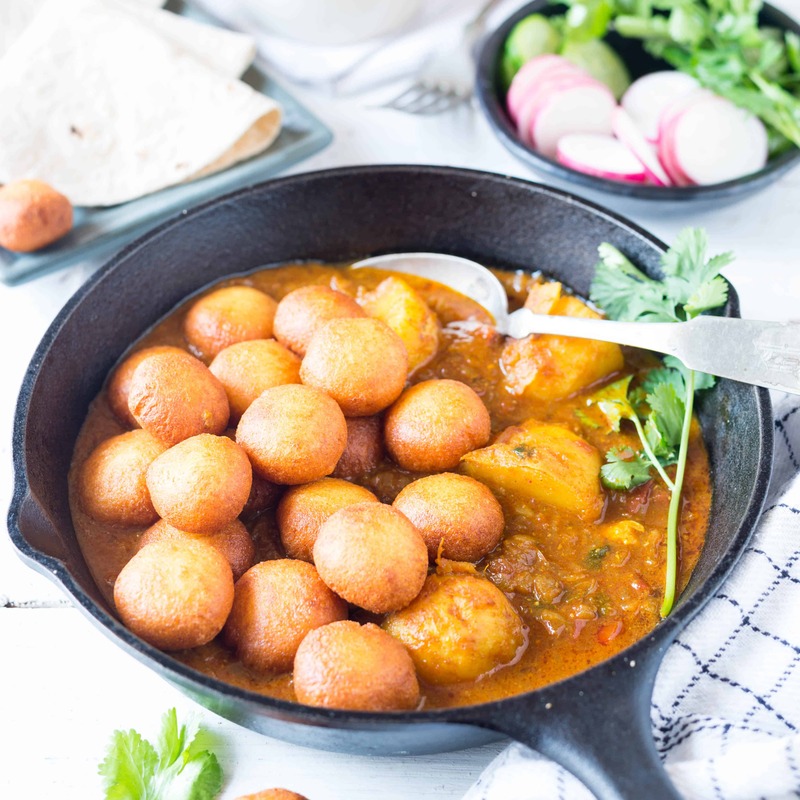 But I am going to share few tips to make the best Indian Curry in the slow cooker. Slow cooker recipes are supposed to be ‘Dump & Forget’ method of cooking. 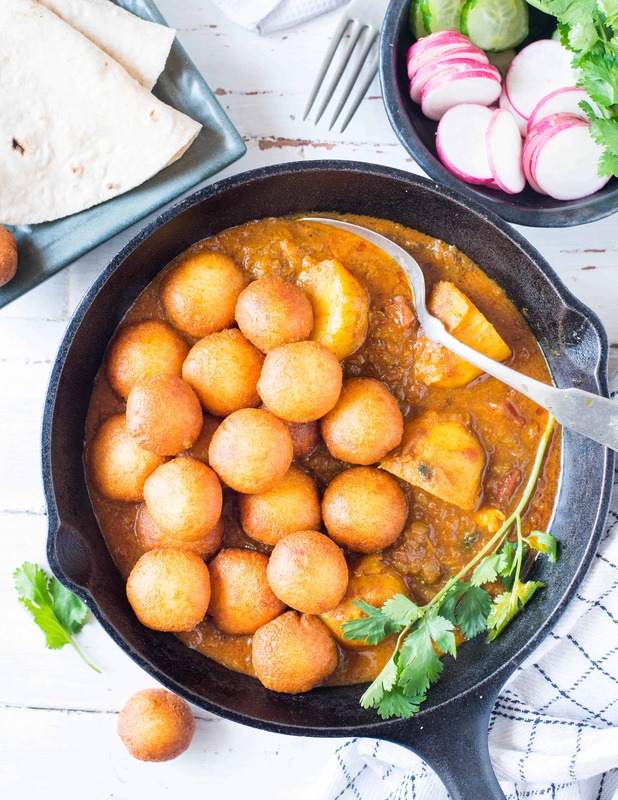 While this method might work for most of the recipes but for a delicious Indian curry you need to follow certain steps. These steps might seem like an extra work, but believe me, it is worth the effort. While you can use boneless chicken breast or thigh pieces, I prefer bone-in chicken for my curry. Chicken remains tender and juicy. It also adds extra flavour to the gravy. To save time packaged spice powders are good. But for the extra flavour use homemade spices powder. I make small batches of spice powder and use them while making curries. While making your own spice powder, roast the spice slightly and then grind it. Next Important step in making a good curry is to make a perfect curry base. This process is called ‘Bhuno’. Sauteing onion. ginger garlic paste, tomato and spice in oil is the key to a good curry. And there is no shortcut to it. Onion, Tomato mixture needs to be cooked in low heat until the oil separates. The caramelized bits bring the depth of flavour. So even the curry is made in a slow cooker, this step shouldn’t be missed. 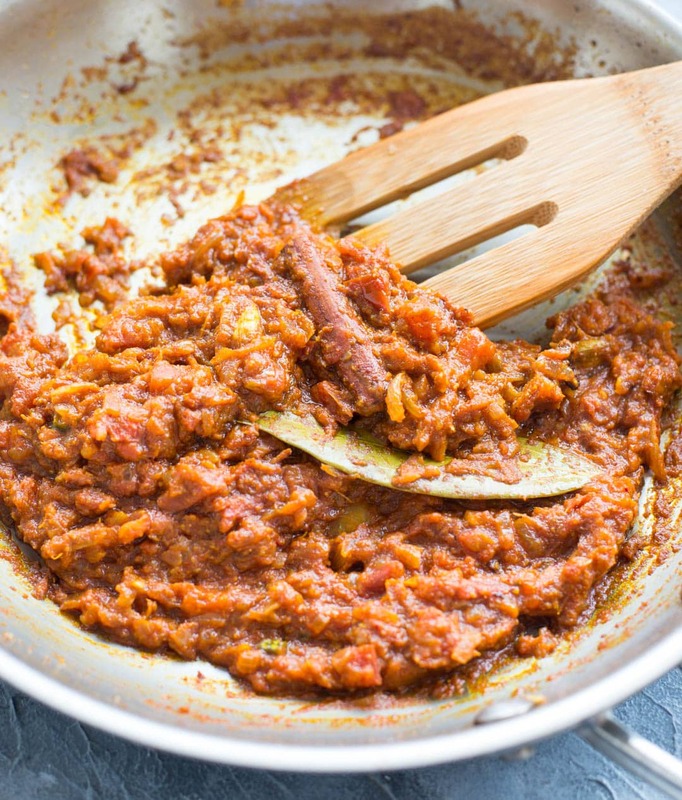 Instead of dumping everything directly to the slow cooker, first, cook the curry base in a pan. Then add chicken, cooked curry base and other ingredients to the Slow Cooker and let it cook slowly. Making Chicken Curry With Coconut on the stove top is petty much similar to any other chicken curry. Once the Onion tomato curry base is cooked, add chicken pieces to the pan. Cook on high for 5 minutes. Then add coconut milk and cook on low covered for 12-15 minutes more. 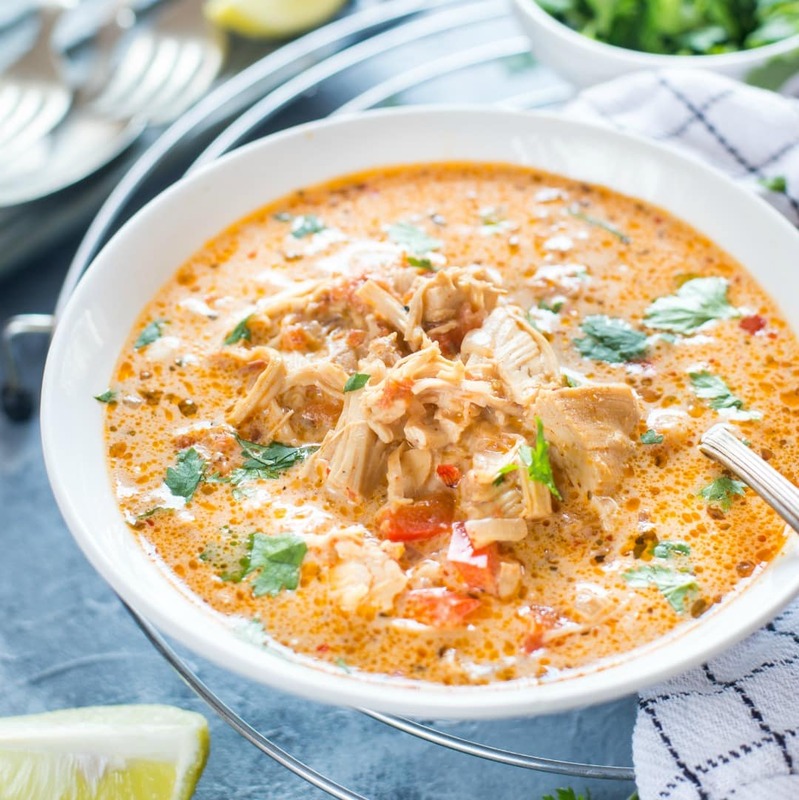 Slow Cooker Coconut Chicken Curry with amazing flavours is rich and creamy. 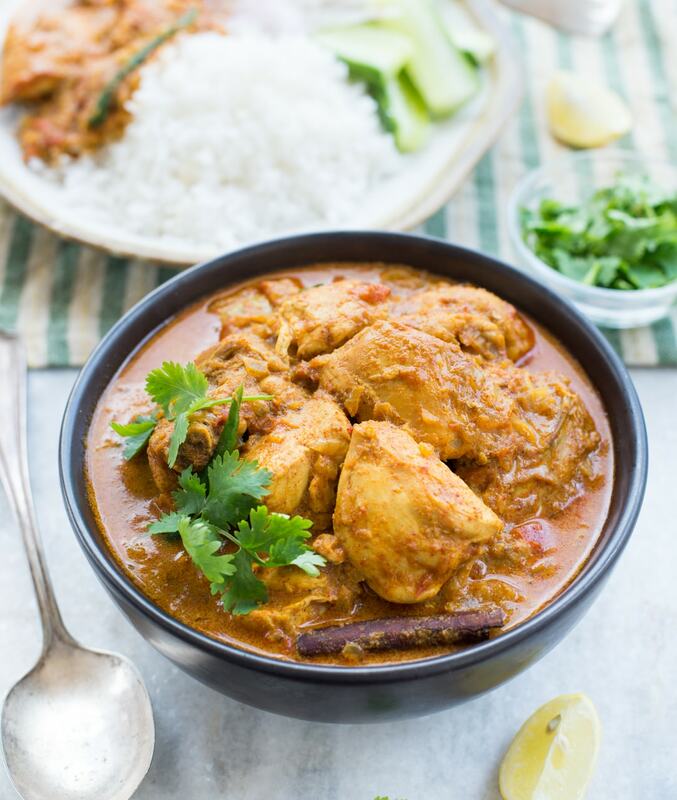 Easy Indian Chicken Curry is made with freshly ground spices for best flavours. Start with the curry base. To make the curry base heat oil in a pan. When Oil s medium-hot, Add whole spices Cardamom, cinnamon, cloves, bay leaf to the pan. When the whole spices start to splutter, Add finely chopped Onion to the pan. Cook on medium flame until the onion starts to brown. Then add a heaping table spoon of ginger garlic paste. Mix well and let it cook for 1 minutes. Add fresh chopped tomatoes along with its juicies. Let it cook. Mean while take a small bowl. Add all the spices mentioned above. Add water and make a smooth paste. When toamtoes start to soften, add above spice paste. Cook eveything on low heat, until oil start to ooze out. Add chicken pieces to the pan and mix everythin well. To make in slow cooker while you do the above steps, pre-heat the slow cooker. Add chicken with the Curry base to the slow cooker. Deglaze the pan with little water and add it to the slow coker. Add coconut milk. Mix well. Cook on high for 2.5 hours - 3 hours / on low for 4-5 hours. While serving, add slitted green chilli (if using) and fresh cilantro leaves. Steps are pretty much similar. To make this chicken curry on the stove top the steps are same. Once the onion tomato curry base is ready, add chicken to the pan. Cook/sear on high for 2-3 minutes..
Add coconut milk. Cover and let it cook on low heat until done or for 15- 20 minutes. 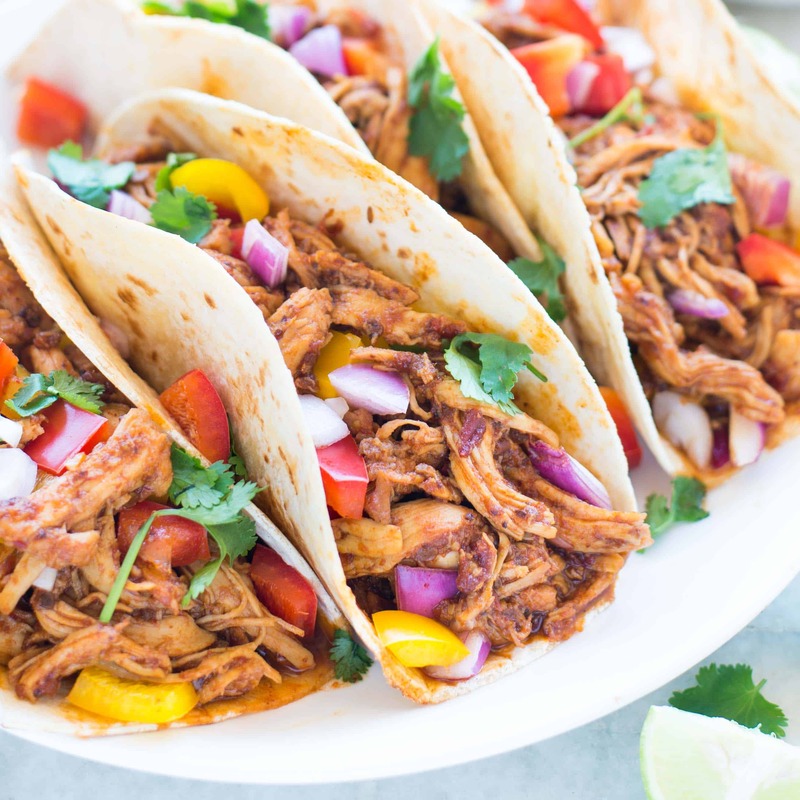 Try this easy and delicious Slow Cooker Honey Chipotle Chicken Tacos on your next Taco Tuesday. Stuffed with Sweet and spicy chicken, crunchy Onion, peppers and fresh cilantro. 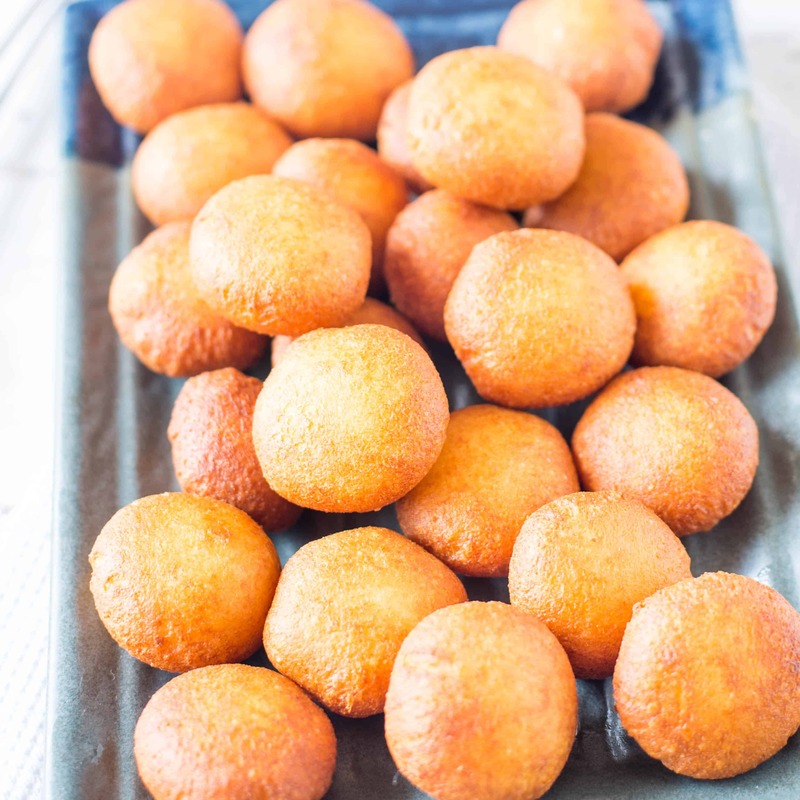 The Smokey Chipotle pepper adds a lot of flavours and makes it a real Mexican treat. 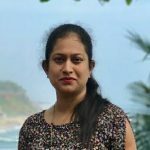 I have a long list of recipes, that I want to try. Every time I strike off a recipe, I add few more to it. So it never comes to an end. Two such items on my list were ‘Tacos’ and ‘Recipe with Chipotle’. After I made this recipe, I happily struck off those two from the list. 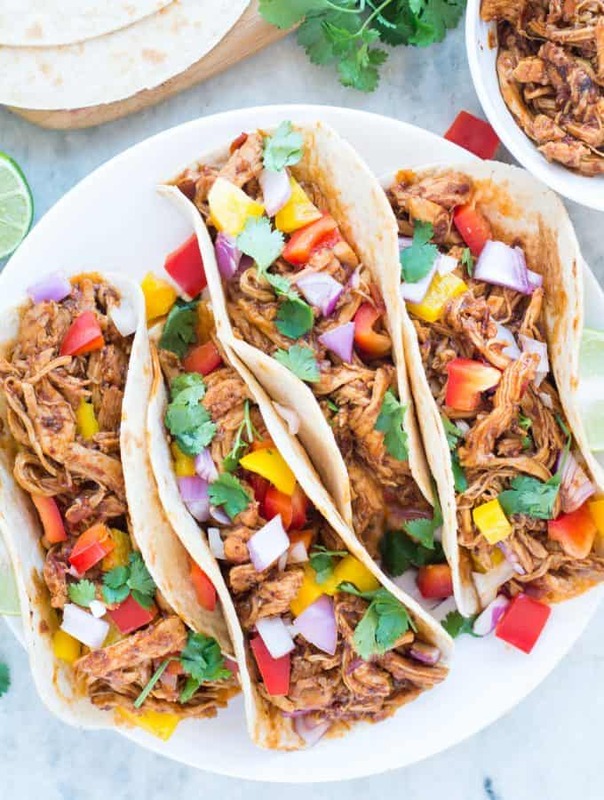 And I also added a couple of more new recipe ideas, after tasting this amazing Slow cooker Honey Chipotle Chicken Tacos. 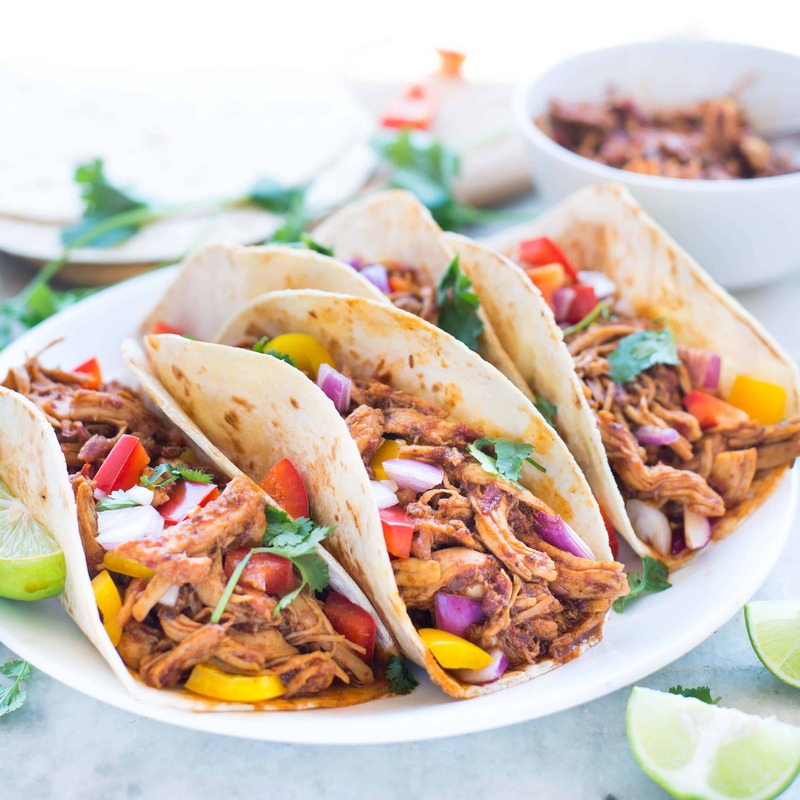 Tacos are so easy to make and one of our favourites. But every time we craved for Tacos, Chili’s was our goto place. I really don’t know, what was stopping me from making Tacos at home. They are the easiest dinner one can make. All you need is your favourite taco shell, stuffing ( chicken, fish, mushrooms… the options are endless) and some toppings. It is ready in 15 minutes if you have prepped your toppings. 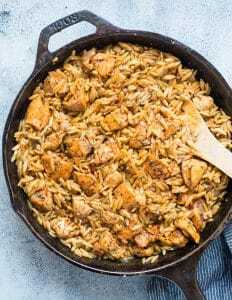 This slow cooker Honey Chipotle chicken is perfect when you want to prepare taco stuffing ahead of time with minimal effort. 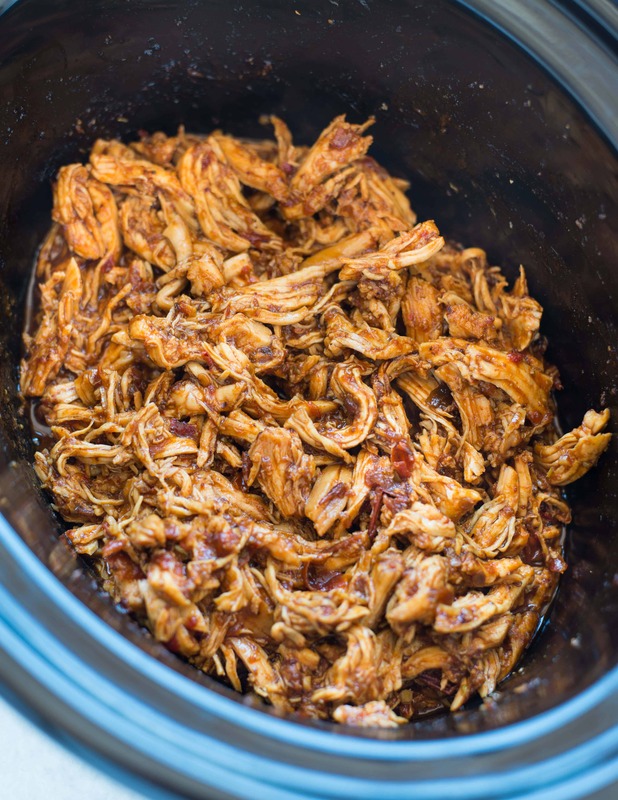 Chicken is slow cooked for hours in a delicious Mexican sauce, so it is juicy and tender. A perfect dump and forget kind of dish. 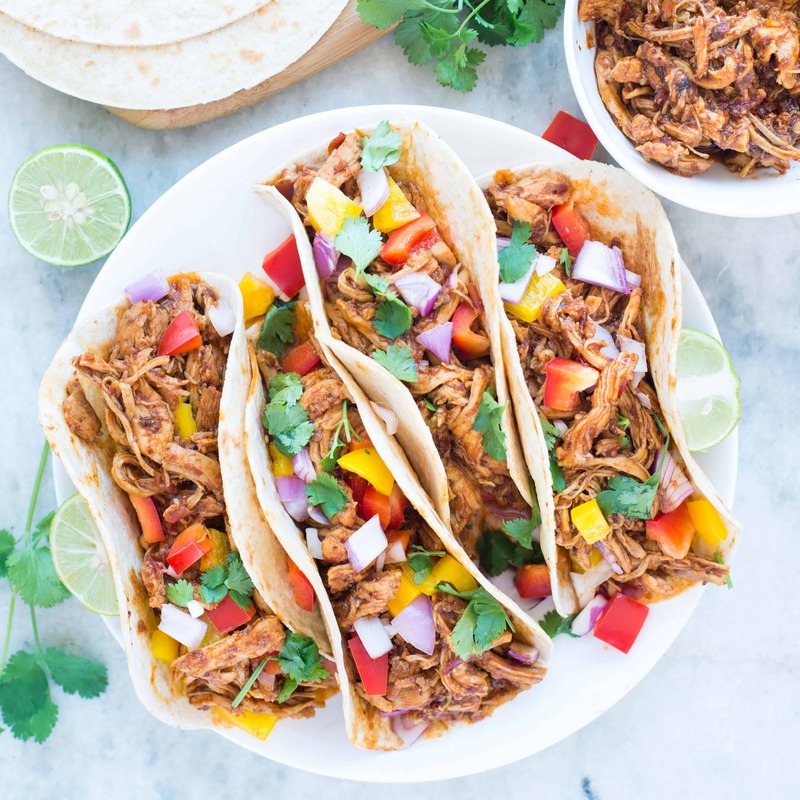 Chipotle Peppers in Adobo Sauce makes the chicken real Mexican. This sauce is the star ingredient in this recipe. The spicy and smoky sauce is balanced with honey. 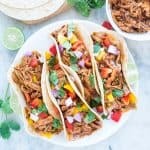 What is Chipotle Pepper in Adobo Sauce? You would get this sauce canned. It is basically Jalepano peppers in a sauce. Smoked and dried Jalapenos rehydrated and caned in a tangy sauce of tomatoes, garlic and other spices. The sauce is smoky, rustic and has a great depth of flavour. This sauce can be added to a lot of things. Make a salad dressing, Barbeque glaze, Soups, dips or toss it with some rice. As a point of caution let me tell you, this sauce is really addictive. So always keep a couple of canes handy. I ordered mine from here. After using half in this recipe, rest of the peppers I ground to a paste, transferred to ice trays. This is for the first time I tried this freezing method, after reading from here. I will let you know how it tastes when I use them next time. The Chicken Stuffing itself has so much complex flavour, that kept the toppings simple. I Just added chopped onions, bell peppers and fresh cilantro. The chicken was juicy and moist, so I didn’t feel the need for any extra dressing. If you like, you can add any of your favourite sauce on the top. After making tacos, I still had some chicken left. I made a Mexican rice bowl, with Rice, Slow cooked Honey Chipotle Chicken, Onion, peppers, Avocados. It was just fabulous. So What are you waiting for??? 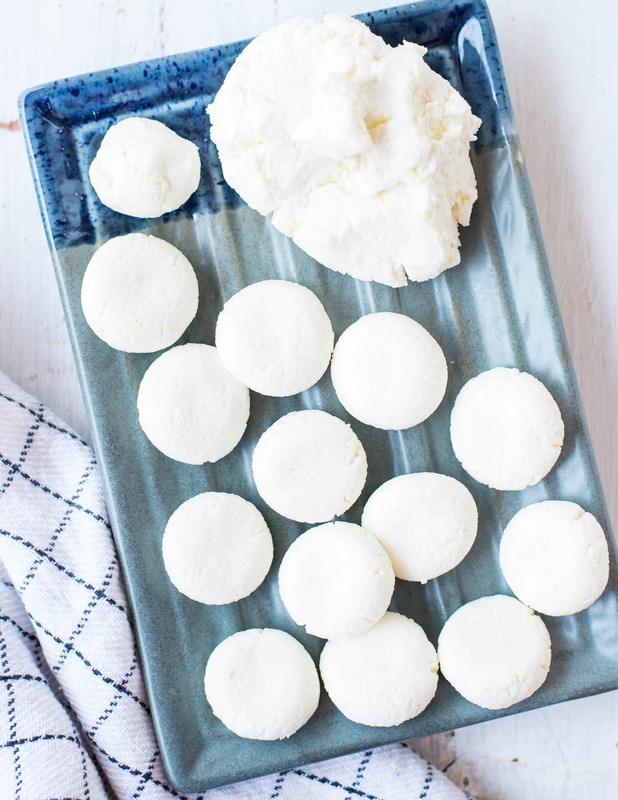 Make a big batch of this and have a stress free week. Using two forks, shred chicken breasts. Cook for another 30 minutes. To assemble, toast flour or corn tortilla. 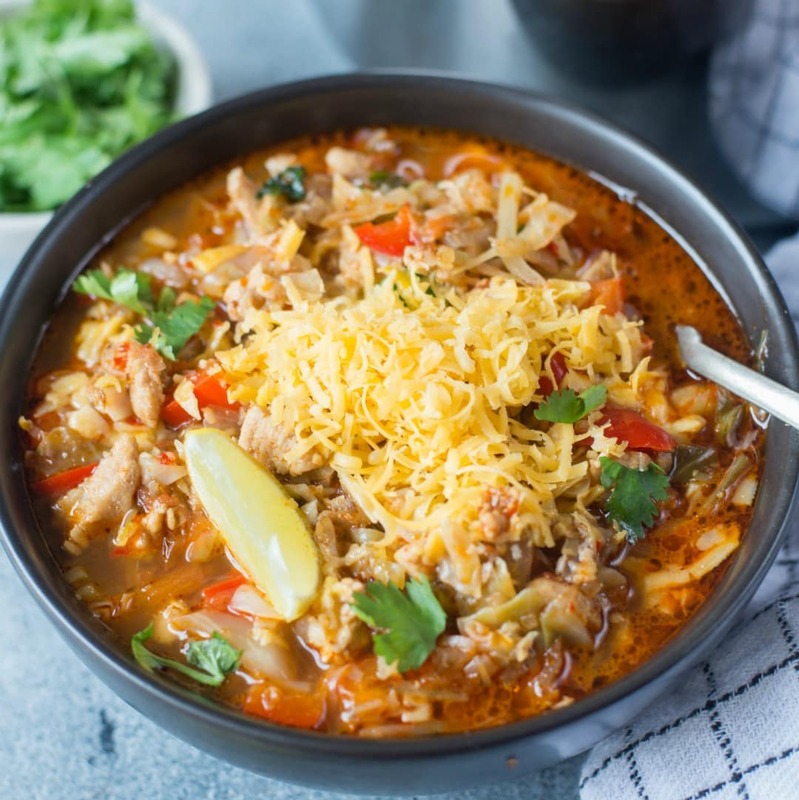 Put the Shredded chicken stuffing, top it with chopped Onion, diced peppers and fresh chopped cilantro. There was a lot of liquid in the slow cooker at the end of 2 hours. So I removed cooked Chicken breast in a bowl. The sauce cooked for another 1 hour on high and reduced to desired consistency. Then I added shredded chicken back to the cooker. Cooked on high for 30 minutes. To speed the process you can reduce the sauce on the stove top as well. 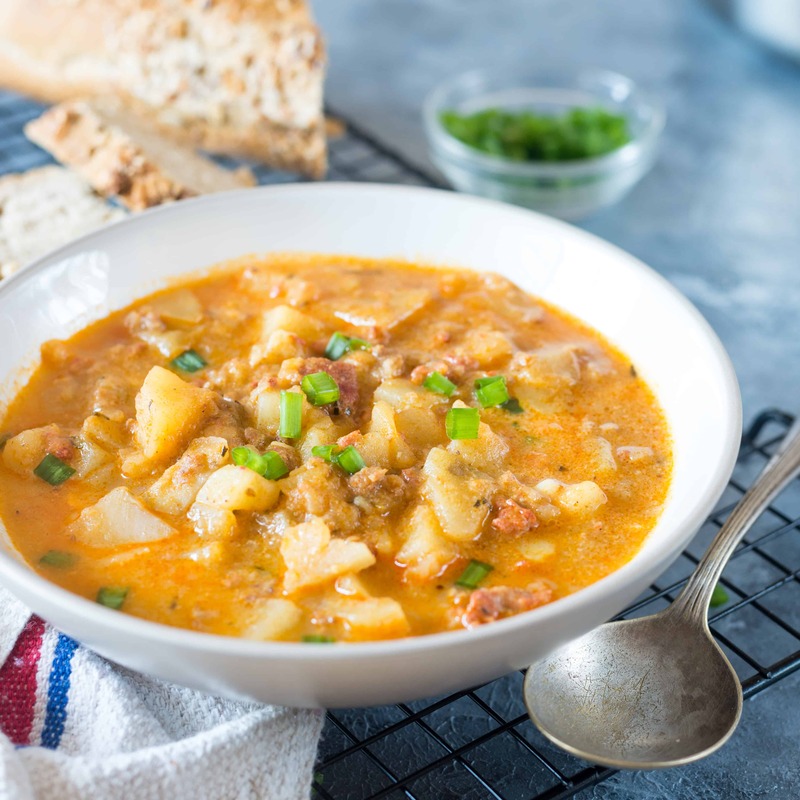 Creamy Chorizo Potato Soup is a rich, delicious and soul-satisfying meal on a cold winter night. Serve this creamy potato soup with a side of crusty bread. Winter is almost coming to an end, so is the soup season. We have to wait one long year for enjoying a bowl of cozy soup. So before it gets warmer, I am trying a few more interesting soups. 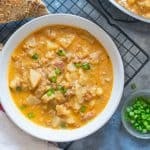 There are lots of potato soup recipe out there. 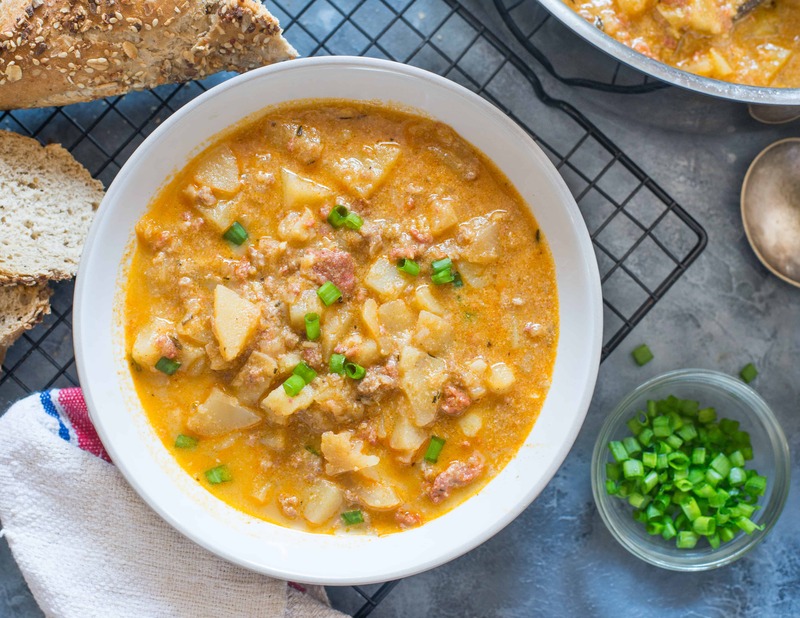 If you love thick creamy potato soup, then I am sure you are going to love this version as well. This smokey Chorizo potato soup I had prepared a few weeks back. It is so hearty and filling. Once the potato is cooked, it makes the soup creamy. So you don’t have to add gallons of cream to make it creamy. This is for the first time I tried Chorizo. We really liked it because it is spicy and quite flavourful. If you have any interesting recipe with Chorizo, then would love to hear from you. I served some crusty sourdough bread on the side and it was a winning combo. This soup is one pot and takes 30- 40 minutes to make. 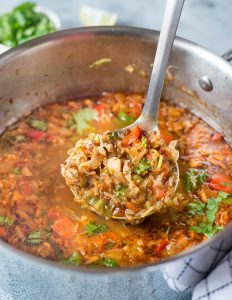 This soup can also be made in a slow cooker and Instant Pot, all you have to do is adjust the cooking time. 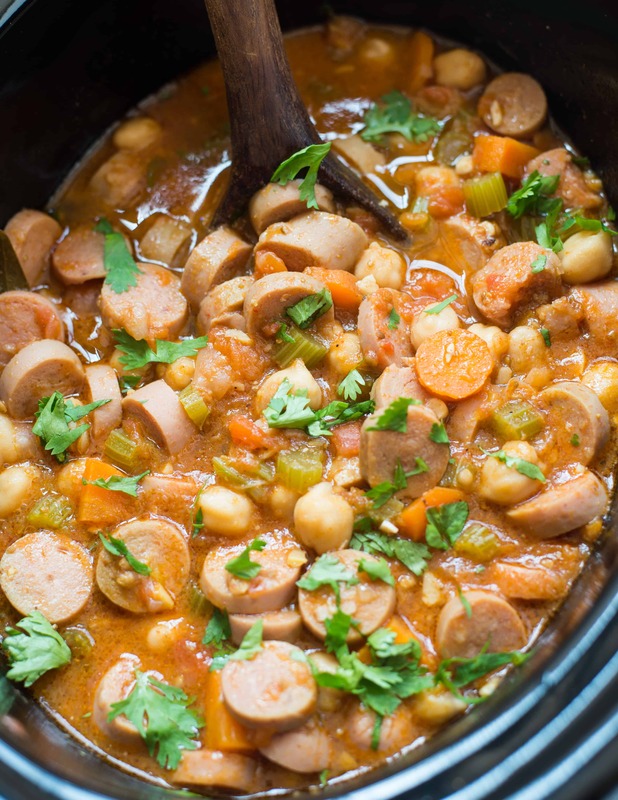 If you are making in a slow cooker, brown the chorizo in a pan and then add all the ingredients to the slow cooker. At the end add milk and cook for another 30 minutes on low. Instant pot version would be even quicker than stove top. So it’s up to you which method you choose. This soup can easily be made in bulk and refrigerated up to 4 days. If it is very thick, then add warm stock to it while reheating and you are good to go. 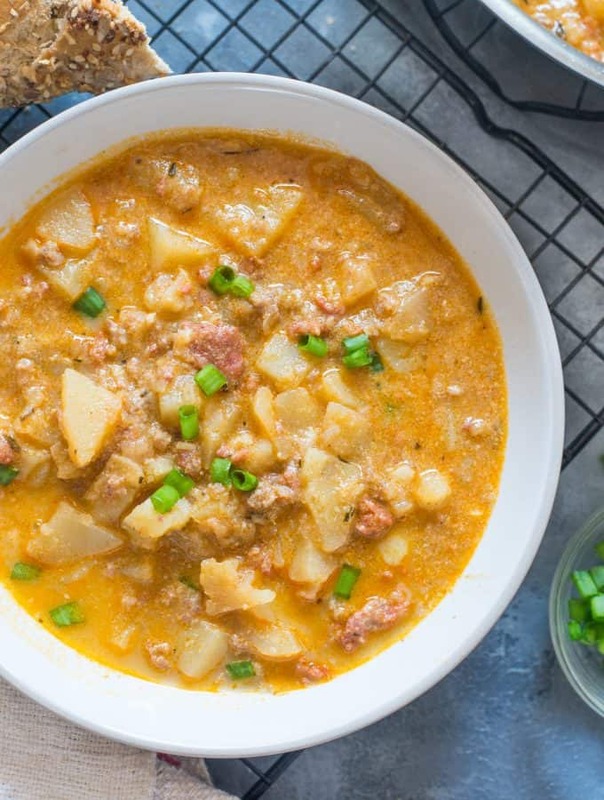 Creamy Chorizo Potato Soup is a rich, delicious and soul-satisfying meal on a cold winter night. Serve this with a side of crusty bread. Once the oil is medium-hot, add Chopped Onion. Fry till it softens. Add chorizo. Cook 4- 5 minutes. It will start to release oil and color would change. Add Cubed potato. Cook on medium heat 5-7 minutes. Add Cumin Powder, thyme and season with salt. Mix well. Stir in between. If required add more stock. Potatoes should be cooked and become soft. 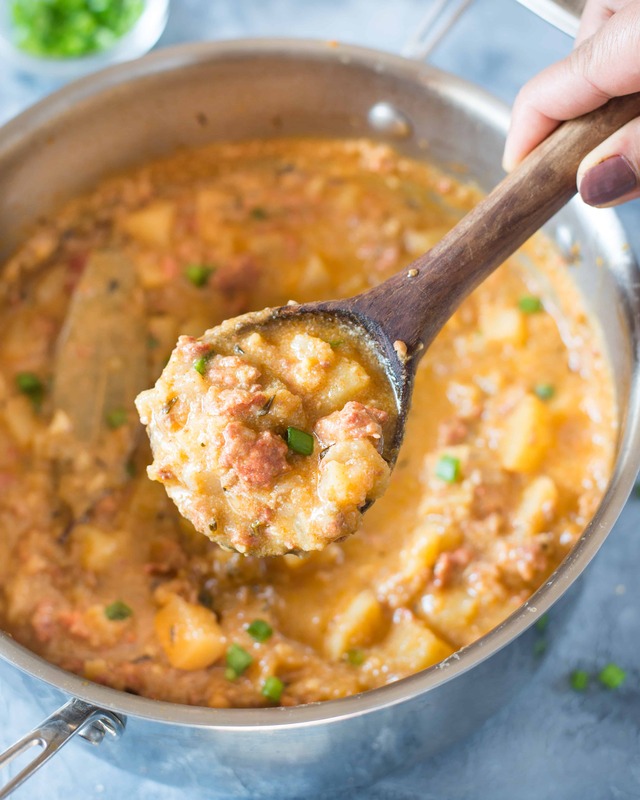 Once potatoes are cooked through,reduce the heat and add milk. Stir well. Cover and let it cook further for another 10 minutes on low heat. While serving, garnish with chopped green onion. The chorizo is spicy enough, so I have not added any chili powder. You can adjust the spices as per your preference. If you want to reduce the cooking time, substitute raw potato with cooked potatoes. 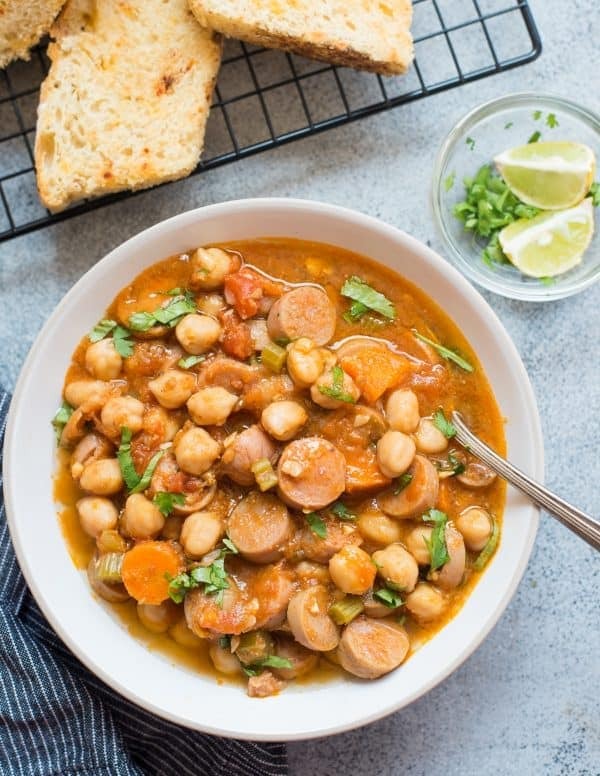 This Slow Cooker Chickpea Sausage Stew is simple, hearty and flavourful. Just throw in all the ingredients and your delicious dinner is ready when you get back home. Here is my second Slow Cooker recipe.The depth of flavor in this comforting soup comes soup comes from slow cooking. With simple ingredients, this Slow cooker chickpea sausage stew is perfect for a cozy winter night. Some crusty bread on the sides will make a complete meal. I won’t mind this stew with a bowl of steamed white rice though. Along with festive season, it is also the wedding season here in India. With so many family weddings lined up in coming months, I will be traveling a lot. While love weddings, family reunion, and the food, I absolutely hate the packing and unpacking part. I am the best example of a procrastinator. I always start packing just a day before we are supposed to leave and the unpacking doesn’t get over for a couple of weeks. ANy amount of planning doesn’t work in this case. Until the panic mode is on, I really don’t start wrapping up my things. On days like these, all you need is a quick, fuss-free recipe to cook. This Slow cooker Chickpea Sausage Stew is the perfect dump everything and forget it kinda recipe. I had made this Soup just a day before leaving for my brother-in-law’s ring ceremony. My home was a complete mess. The house help didn’t turn up for a week. With all that extra workload, I had to complete few recipe testing and shooting. I also had to clean up my refrigerator before leaving. Usually, when I run out of vegetables, I soak some beans for the next day. With all the last minute prep, I just dumped cooked chickpeas, leftover veggies, and some sausage. By the time I was done with my work I was dead tired. But the good thing was, I had my dinner ready. There was some leftover No knead rustic bread, that I toasted. This stew is light and with delicate flavors. A bowl of this is surely going to give you the comfort on a cold winter night. Heat Oil in a pan. Add Garlic. Fry for 30 seconds. Add Onion. Saute till onion is translucent. In the Slow Cooker add all the ingredients, except coriander leafs. Cook on high for 4-5 hours. At the end, smash few chickpeas with the back of the spoon. It will make the stew bit thick. Garnish with fresh cilantro leaves before serving. * I soaked dry chickpea overnight. Then cooked until just cooked. 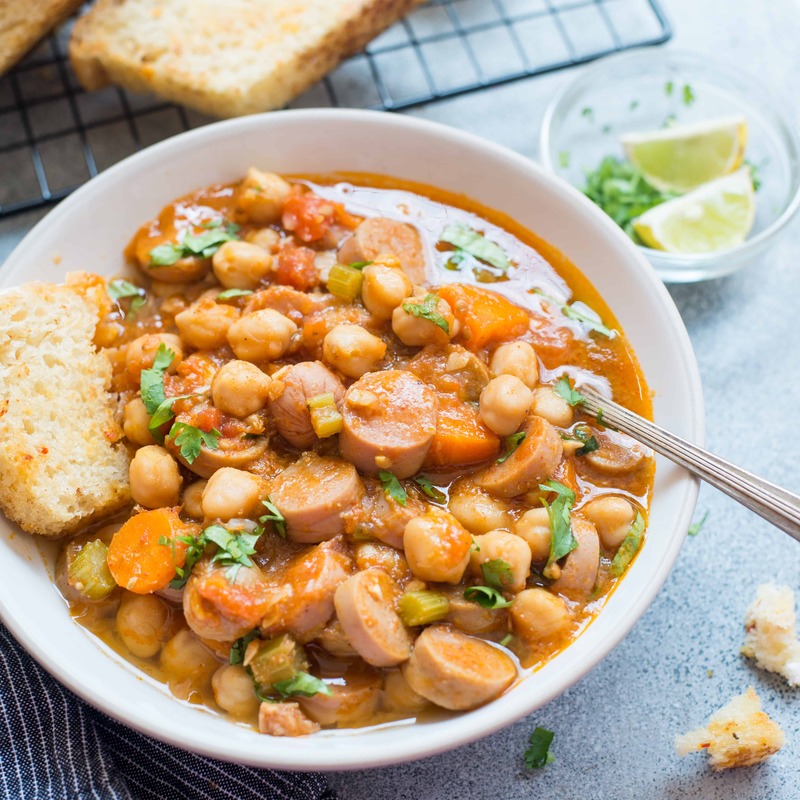 You can also use canned chickpeas. Darin all the liquids and measure. ** I blanched roughly 4 tomatoes. You can substitute it with canned tomatoes. *** You can also add red bell peppers to the stew. Adjust the spices as per your preference. **** You can cook on low for up to 8 hours. TO quicken the cooking process add warm stock.